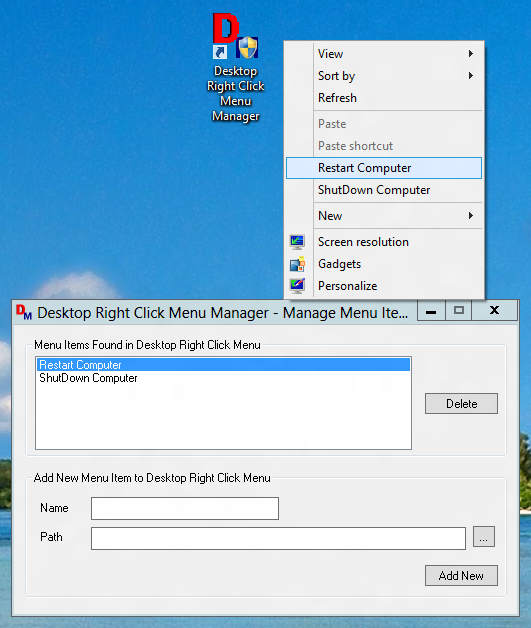 Desktop Menu which is displayed on Right Click on Desktop of Windows 8 is the easiest way to control Windows 8 Settings. Many Applications add New Command to the Right Click Menu of Windows to allow users o easily launch or configure application. The Software presented here is a small application which allows you to easily manage this Right Click Menu of Windows 8. This Tool allows you to add new command and delete existing commands from the Right Click Menu of Desktop. In order to use this tool you would need to understand compatibility mode of Windows 8 as well. The Above Screenshot displays the Desktop Menu Management Software with 2 extra commands added to the Right Click of Desktop. The Shortcut displayed in the screenshot is the tool which was used to launch the software. This Desktop menu Management Software requires you to run the application with admin rights. As the extra commands added in the Desktop Menu will be visible to all users of the computer, you need to understand this and authorize yourself with optional user name and password with administrative privileges. The Restart Windows and Shutdown Windows 8 Commands were added using another Desktop Shortcut Software on this Windows 8 64 bit computer. As of this writing the Desktop Menu Manager Software works only on Vista and hence to run this software on your Windows 8 Computer, you would need to run this application with compatibility mode of Windows Vista as displayed in the screenshot below. In order to configure the Menu Manager Software with Windows Vista Compatibility Mode, right click on the Shortcut, select properties and navigate to the Compatibility Tab. From the drop down of available operating systems, select Windows Vista and Close the Properties Screen using the OK button. 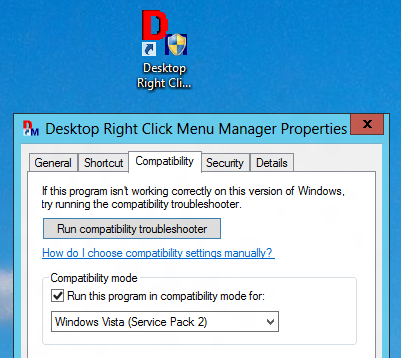 Once you have configured the Windows Vista Compatibility Mode for the Desktop Menu Software on your Windows 8 or Windows 7 Computer, you can easily control what commands are displayed in the Desktop Right Click Menu of your Windows 8 or Windows 7 or Windows Vista Computer. The above screenshots were captured on a Windows 8 64 bit computer the software works fine on 32 bit versions of Windows Vista onward computers as well.